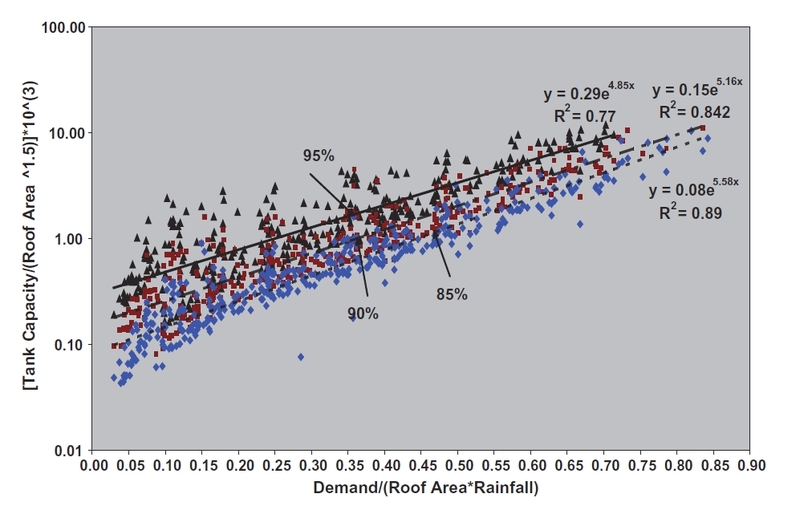 A recent paper by Khastagir and Jayasuriya from RMIT provides a quick way to estimate the size of a rain tank that is required to meet demands with a specified reliability. Relationships for three reliabilities are shown in the following figure which shows the scatter of data that has been used to fit the equations. What tank size is required to provide 95% reliability for a 3 person household, roof area = 200 m2, annual rainfall = 700 mm, demand is for toilet flushing. For a three person household, annual demand for toilet flushing will be . 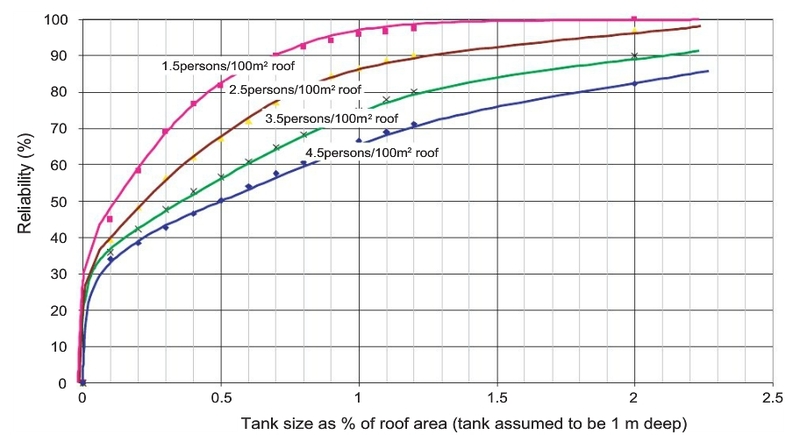 We can compare these results to another tank sizing guide provided in Chapter 12 of WSUD: Engineering procedures stormwater. This book provides the following chart for tank sizing. The chart was developed based on modelling that used rainfall data from Melbourne with a mean annual rainfall 657 mm. Demand is for toilet flushing at a rate of 20 L per person per day, higher than the 16 L used by Khastagir and Jayasuriya. Our three person household has a equivalent of 1.5 persons per 100 m2 of roof area. For a reliability of 90%, the required tank size is 0.7 * 200 = 1.4 kL. Using the Khastagir and Jayasuriya approach. So the capacities are in the same ballpark and either is probably ok for an initial estimate. Better estimates could be obtained through modelling (for example, see Mitchell, 2007). The advantage of the Khastagir and Jayasuriya approach is that it easy to generalise to different demands, roof areas and rainfalls. A vectorized R function to implement the method of Khastagir and Jayasuriya is provided below. This entry was posted in Hydrology, R, Uncategorized on August 21, 2014 by tonyladson.